A Hario coffee grinder means a simple design and good results. If you are a dedicated coffee drinker with a penchant for novel and intimate coffee preparation methods, Hario products would be a wonderful addition to your arsenal. They are simple, beautiful, and inexpensive. A high-end Hario mill will offer the same precision and grinds uniformity as even the most expensive commercial burr grinder, and it would do so at a tiny fraction of the price. Even if you can’t be bothered with manually grinding on a Hario mill every time you want a cup of coffee, the low price justifies owning one merely as novelty item. In this list we take a look at the most popular Hario grinders, as well as showing you some alternatives. After going through many existing coffee grinder reviews, we have compiled a list the best Hario grinders. The Hario Slim is a small yet convenient coffee grinder, priced a bit lower than the Hario Skerton. Its small size makes is a perfect travel companion and allows for easy storage, but only allows for small quantities. Featuring the same build quality and grind coarseness as the #1 and #2, the Hario MM-2 has a far more distinctive look. Its vintage design makes it stand out in your kitchen while having a very friendly price. Capresso, owned by Swiss Jura AG, is an American purveyor of high-end coffee equipment. A combination of the name “cappuccino,” and “espresso,” Capresso’s name is in line with its mission to introduce European-style coffee equipment to the American market. Their product line includes drip machines, espresso makers, grinders, kettles, frothers, and more. Capresso also has a product listed on our coffee maker with grinder list, the Capresso Coffeeteam GS. Started by Shibata Hiroshi in 1921, Hario initially developed glassware for industrial and laboratory use. In 1940, Hario expanded its operations to melting glass with a crucible furnace. In 1949, Hario launched its first consumer product, a glass filter siphon coffee maker, similar to the European-style vacuum brewer. Less than a decade later, the design of the siphon brewer was modified, and Hario released a cloth filter version in 1957. This brewer design is still used today. In 1962, Hario partnered with Sony to manufacture the glass bulbs for their television sets. 1965 saw the introduction of one of Hario’s most successful consumer products, a glass freezer pot. In 1972, Hario upgraded their glass melting plants from crucible furnaces to direct electric glass melting furnaces, eschewing a modern production shift to factories without smokestacks. Over the next few decades, Hario bolstered their product lines with a wide variety of consumer products, including coffee brewers, hand-operated grinder mills, teapots, automobile beam lenses, and a myriad of accessories. Today Hario enjoys a worldwide reputation for its laboratory-quality glass, and the beautiful rustic aesthetic of its products. Nearly 100 years after its conception, Hario still manufactures the glass for its products in Japanese plants. However, due to increased competition, new innovations in the coffee equipment industry and decreasing prices, Hario has outsourced product assembly to contract manufacturers in China. Hario products are simple, elegant, and striking in appearance. Hario’s designs aim for classy minimalism, often handily achieving this with their top-notch traditional aesthetic. Described by many as rustic, Hario’s glass is often coupled with more traditional materials like wood, copper, and ceramic. Hario Ceramic Coffee Mill Skerton is an entry-level, hand operated mill grinder that uses rotating burrs to break down your coffee beans. It is a small, simple, and cost-effective solution for freshly ground coffee of any coarseness. This Hario coffee grinder features an attractive industrial design and is built from high-quality glass and ceramic. The Hario Skerton represents one of the least expensive ways to produce fresh and uniform grinds for any brewing method under the sun. Despite the seemingly ancient technology, this Hario coffee grinder is incredibly simple to use and even easier to clean. There are no buttons, no dials, and no settings to memorize—just a hand-operated mill and a grinds container. Fill the chamber and spin handle to grind. It features a high-quality glass and ceramic construction that keeps the aroma of your beans as intended. Grind coarseness can be modified by adjusted in clicks—farther for coarser, closer for finer. The burr mill produces incredibly precise and uniform grinds. Given that this is a hand-operated mill, its RPM is very low compared to electrical grinders. This preserves all the intricate aromas and flavors of your favorite coffee beans. Grinding by hand also makes for a more intimate coffee preparation experience. Finally, this is a very quiet mill, with the only audible sound coming from the cracking beans. Using manual technology like the Hario Skerton is bound to have some drawbacks. For one, hand grinding on the Hario Skerton can take substantially longer than using an electrical grinder, up to 2 minutes per cup. Also, the Hario Skerton exhibits a little bit of wobble on the coarsest settings, which may produce uneven grinds for your French press. This can be remedied with a lower bearing modification, however. Finally, if you are entertaining a large party of guests, be prepared for the forearm workout of a lifetime. Although by no means perfect, the uniformity of grinds produced by this Hario coffee grinder will rival much more expensive electrical models. Providing a much more intimate coffee preparation experience, the novelty factor alone makes the Hario Skerton worth a purchase. One of the smallest hand-mills on the market, the Hario Coffee Mill Slim Grinder is a cheaper, smaller, and less sturdy alternative to the Hario Skerton. Its simple, attractive design features a detachable handle and a tiny footprint for convenient storage. Despite the lower quality plastic construction, this device actually boasts several advantages over the larger Hario Skerton. The first notable feature of the Hario Slim grinder is the convenient markings on the plastic that help determine the appropriate grind quantity. Like the Skerton, its ceramic mill produces a very uniform grind, comparable in precision to expensive high-end electrical grinders. Its grind texture is also adjustable by rotating the burr mechanism, closer for finer grinds, and farther for coarser grinds. Because this Hario grinder is operated by hand, the low RPM produces very little heat, keeping flavor and aroma of beans intact. This mill is also very quiet, with the ceramic burrs being drowned out by breaking coffee beans. Finally, this grinder is very reasonably priced. The Hario Coffee Mill Slim Grinder grinder is simply the cheapest gateway to high-quality, uniform, and fresh coffee grinds. The Hario Slim grinder has many of the same faults of the Hario Skerton or any other Hario hand grinder. Hand-operation can turn into a morning workout; it can take several minutes to produce enough grinds for a single cup of coffee. Coarser grind settings cause the ceramic burrs to wobble, producing less consistent grind. Unique to the Slim, the low-quality handle has a tendency to break or wear down. The skinny plastic container can also be hard to grip for extended periods of time Finally, this Hario coffee grinder is not ideal for entertaining large groups of people—stick to automatic grinders for that. Even with its cheaper construction and low-quality handle, this Hario coffee grinder is very reasonably priced. Choosing between the Hario Mini Mill and the Hario Skerton is a judgment call; the Skerton is ideal if you want higher quality materials, whereas the Slim is ideal if you want a smaller and cheaper device. If you're into an antique looking manual grinder, this list is highly recommended, especially if you like the look of the Hario MM-2 which is #3 here. If you're into manual coffee grinding but are not sure whether you want a Haro grinder or not, this list will probably help you out. If budget plays a role as well, then this list might help you out. The Hario Mini is included, along with several other grinder under $100. The Hario MM-2 is a hand-operated burr mill with a unique design. It features a beautiful vintage aesthetic, ceramic burrs, a stainless steel handle, and a wooden body. Its rustic design errs on the side of antiquity and makes for a wonderful collector item. This is an inexpensive manual burr grinder that makes coffee preparation a most intimate experience. While it is almost functionally identical to both, the Skerton and Slim Hario burr grinder, the MM-2’s biggest distinguishing factor is its beautiful vintage design. It uses high-quality materials, such as ceramic, wood, and stainless steel to achieve a fantastic rustic aesthetic. Its adjustable ceramic burrs produce grinds just as uniform as those from the Hario Skerton or Hario Slim.However, unlike the two aforementioned mills, the Hario MM-2 has no issues with coarser grinds like French press. Thanks to a set of rubber feet beneath the grinder, it also won’t be sliding around as much. Another nice touch is the magnet holding the drawer closed during the grinding process. As expected, the MM-2 is very quiet while grinding. Although this has already been established, it still must be noted that grinding with a hand mill is a slow process, with a single cup taking up to 3 minutes. An issue specific to the MM-2, the grinds drawer appears to hold a smaller volume than the hopper, and will overfill on occasion. The drawer is also not as airtight as other grinds containers, such as Hario’s Canister model. Some customers have also complained about the fragility of the wood. Furthermore, the screw at the top of the device may come loose after extended grinding sessions. This Hario coffee grinder boasts several functional improvements over the Hario Skerton and Slim and is also more attractive. Its higher price point is very reasonable and entirely justified for coffee aficionados who have a weak spot for beautiful, vintage designs. The Hario Canister Ceramic Coffee Mill is a mid-range hand-operated grinder. It features a beautiful rustic-styled copper aesthetic and sturdy build quality. Its “Canister” namesake is a large mason jar styled sealable grinds container. The ceramic burr mill easily attaches to the top of the jar and is operated in the same fashion as all of Hario’s other burr mills. The head of the grinder features a shiny metallic finish, and is mounted on top of a beautiful wooden platform. It is in fact one of the most beautiful looking grinders in the Hario ceramic coffee mill range. The Hario Canister features beautiful, high-quality glass aesthetics with several improvements in design. Its mason jar styled container is airtight, and thus keeps grinds fresh for longer periods of time. Like the MM-2, it features a set of rubber feet that keep it from sliding around the counter while you’re grinding. Like all the other Hario coffee grinders, its grind coarseness can be adjusted to any consistency you see fit. Its ceramic burrs are also very quiet. Because this is a hand-operated burr, long grinding times are to be expected. As the burrs can “wobble” while the handle is being cranked, the Hario Canister has the same issue with grinding at coarser setting as the Hario Skerton and Slim models. As expected from all other Hario products, this mill only comes with Japanese instructions, so you might have to look up some videos to figure out the intricacies of adjusting the coarseness. Despite its higher price point and seemingly insignificant improvements over the Hario Skerton burr mill, the Hario Canister is still very reasonably priced. If the design of this hand mill is more appealing to you, there is little reason not to invest in one. The Porlex JP-30 is a very popular hand grinder on our site so we did a detailed review on it. If you are looking for a beautiful vintage coffee grinder, you should look no further than Zassenhaus. Hario and Kyocera work closely together, both coming from Japan and even sharing one of their products. The Hario Ceramic Coffee Mill Acrylic Box is a mid-range hand-operated burr grinder. It features the simplest design of all other Hario hand grinders, using a clean, see-through acrylic aesthetic that reveals the inner ceramic burr mechanism. Where the other grinders focused on form, the Hario Acrylic Box focuses on function and convenience. Although not the most beautiful Hario hand grinder, its compact box design makes this grinder much easier to store. Its handle can also be detached from the grinding mechanism and slotted into the box. The stable box-shaped design makes this one of the sturdiest and most stable Hario grinders.Replacing the rubber feet of the MM-2 and Canister, the Acrylic Box uses a silicone suction base to keep the grinder glued to the counter as you crank the handle. The ceramic burr mechanism is identical to all of the other Hario grinders and can be adjusted in clicks to produce your desired coarseness. Its grinds uniformity is great and handily beats most grinders under $100. It is quiet, easy to use, and even easier to clean. This grinder’s acrylic construction introduces a problem unique to the Acrylic Box: static cling. Although the static buildup is nowhere near as bad as it is on electrical blade grinders, it can still be annoying. 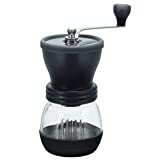 Like the other Hario grinders, the Acrylic Box’s grinding times are long, taking up to 3 minutes of constant cranking to produce enough grinds for a single cup of coffee. Although not as extreme as it is on the Hario Skerton and Slim, bur wobble afflicts the Acrylic Box on its coarsest grind settings. Although this may not be a disadvantage to most, the Acrylic Box is the most aesthetically boring, non-descript Hario grinder available. This burr mill is an anomaly in the Hario hand grinder product line; it isn’t particularly attractive compared to the other hand mills. What this mill lacks in aesthetics, however, it makes up for in convenience. If your interest in hand-operated mills is strictly practical, the Hario Acrylic Box is a fantastic value. is strictly practical, the Hario Acrylic Box is a fantastic value. This is a bundle of the previously outlined Hario Skerton coffee mill and the Hario V60 Buono Kettle. The Hario V60 kettle is a small, beautiful, stainless steel container designed with maximum pour control in mind. These two products are a fantastic combination for producing a delicious cup of pour-over coffee. Since we have already outlined the Hario Skerton in some detail in another entry, we will focus on the Hario V60 Buono Coffee Drip Kettle for the majority of this write-up. The Hario V60 Drip Kettle has a fantastic, thin spout design, ensuring a smooth, consistent stream of water that brews your coffee evenly. Its straight, ridged handle is ergonomic and comfortable to hold. The pour control is phenomenal, and much more precise than can ever be achieved with an all-purpose kettle. This is exactly what a great cup of pour-over coffee requires. The Hario V60 is simply a fantastic kettle for this niche application. Although a great value for the price, this combo package is one product short of having the necessary components to actually brew a cup of coffee. You still need to purchase a pour over brewer, filter cone, or at the very least, a pack of single-serve filters. The Hario V60 kettle’s dainty design has a few disadvantages too; its opening is too small to clean, and completely drying the kettle is a near impossibility. The low conductivity of the kettle means that it takes twice as long to boil water than a standard kettle. Finally, filling more than the “practical” capacity of the kettle (800 mL) will cause boiling water to bubble out of the spout. If you already own a pour over brewer like the Chemex this Hario bundle will produce an absolutely delicious cup of coffee, every time. If you don’t own a pour over brewer and are willing to invest in one, this bundle is a worthwhile purchase. However, if you don’t own a pour over brewer and are not interested in investing in pour over, the Hario V60 Buono Kettle is a somewhat useless product, and the excellent Hario Skerton mill can be purchased separately.